One of our most requested dishes is Shrimp & Grits. Chef Raymond Jackson demonstrated how he prepares this Alvin & Friends favorite for Rob Petrone’s TV show Restaurant Hunter and shared the recipe, so we are posting it here on our blog for you. Of course we can’t guarantee this dish will taste exactly the same at home because we import our stone-ground grits from The Original Grit Girl in Oxford, Mississippi…. Watch for us on a special holiday episode of Restaurant Hunter airing Thursday, November 19th at 8 pm on FIOS 1. Combine the milk and water in a 2 quart pot and bring to a simmer. 2. Pour the grits in slowly and whisk vigorously to avoid clumps and sticking on the bottom. 3. Allow the grits to simmer steadily for 30-40 minutes, stirring occasionally. Cook until tender (no longer gritty). Grits should be thick but not stiff and not runny. If grits are too thick add a touch more water. 4. Season with butter, sugar and salt and pepper to taste. Cover and keep warm. 2. Once the onions and garlic are translucent and mustard, brown sugar and vinegar. Stir the mixture and allow the sugar to melt slightly. 4. Add the chicken stock and reduce down to 1 cup of liquid. 5. Add heavy cream and turn down the heat to low. 6. Whisk in the butter 2/3 cubes at a time and allow cubes to melt and emulsify into the sauce. NOTE: Add 1 smoked ham hock or bacon to add some smoky flavor. Once the sauce is finished you can strain it through a sieve or leave it chunky for a more rustic presentation. Thoroughly season the shrimp with the spice mix. 2. Add a splash of oil to a large hot sauté pan and add the shrimp in one layer (sear multiple batches if necessary). Sear shrimp on first side until the bottom turns opaque and flip over. 3. Once shrimp are flipped over add peppers and onions and season with salt and black pepper (or more Cajun spice mix if available). 1. Using a large kitchen spoon, divide the hot grits between four plates; and using the back of the spoon, press an indentation into the center of the grits. 2. 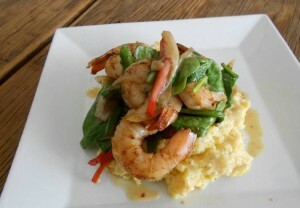 Place 5 shrimp and vegetables into the well of the grits. 3. Spoon the pot likker butter sauce on top of the shrimp and around the grits. — Alvin & Friends Executive Chef Raymond Jackson, as featured on “Restaurant Hunter” on FiOS1.